This world-renowned Armenian singer tops his 50-year career by giving the concert of his life in the holy city of Jerusalem, accompanied by his son Ara (Night Ark, An Armenian In America) and an international all-star ensemble. ONNIK DINKJIAN was born in Paris, France in 1929. His parents were born in Dikranagerd (Diyarbakir), Turkey. He overcame the difficulties of being orphaned at a very early age by finding comfort and happiness in singing, initially in the Armenian Church of Paris. Upon arriving in America in the late 1940s, he began performing at secular functions and quickly became the most-loved singer of the Armenian-American community. To meet the demands of his audience, he released several recordings of Armenian folk and popular music. However, Mr. Dinkjian, an ordained deacon, never lost his great love of Armenian liturgical music, and released an entire CD (“Havadamk”) of emotionally performed sacred hymns of the Armenian Church. His fame as a great interpreter of Armenian song has brought him to concert halls throughout Europe, The United States, and South America. In addition to his singing, Mr. Dinkjian has composed many songs, some of which are sung in his native (Dikranagerd) dialect. He has passed his love and passion of Armenian music to his son, oud player and composer Ara Dinkjian. After my concert at the 2005 Confederation House Jerusalem International Oud Festival ("An Armenian In America"), I gave its director, Effie Benaya, a CD of my father Onnik. He suggested that perhaps my father should appear with me the following year. Dad was concerned, rightfully so, that no one in Jerusalem knew him or his music. Luckily, I was able to convince him that all he needed to do was sing from his heart, as he always had. From the very first note, the audience embraced my father, who gave us a night we will never forget. We must make special acknowledgment to the incredible musicans who joined us: Sokratis Sinopoulos (lyra), Tamer Pinarbasi (kanun), Adi Rennert (keyboard), and Zohar Fresco (percussion). One of the first times that Ara Dinkjian performed on stage with his father was in New York City during the 1964 World’s Fair. Dressed in a costume that his mother sewed consisting of baggy pants, a colorful shirt and a vest with ornaments, he played the doumbek, a hand drum, in front of crowds of people. The performance was part of a celebration of Armenia. “I grew up in a home where music was as common as eating every day,” Dinkjian says now. “There was constantly singing and instruments in the house.” That’s because his father is Onnik Dinkjian, a renowned musician of Armenian heritage. “There was never a question of, ‘Who am I and what do I want to do with my life?’” the younger Dinkjian says. The Smithsonian Center for Folklife and Cultural Heritage, which hosts the festival, got involved in Armenia in 2014 as part of the My Armenia project, which works with the local people to enhance cultural heritage sites there. The festival is built on research from that initial project, according to Halle Butvin, curator of the Armenia program. Butvin says she has made so many trips to Armenia since 2014 to prepare for the festival that she lost count. At the festival, the Dinkjian performance will include a dialect that Armenians once spoke in his grandparents’ hometown. “There hasn’t been an Armenian born there in over 50 years,” he says. “You will hear a dialect that is on the verge of being extinct.” Besides appearing with his father, Dinkjian will also perform with The Secret Trio, a band whose other members are Turkish and Macedonian. His main instrument is the oud, a fretless lute. 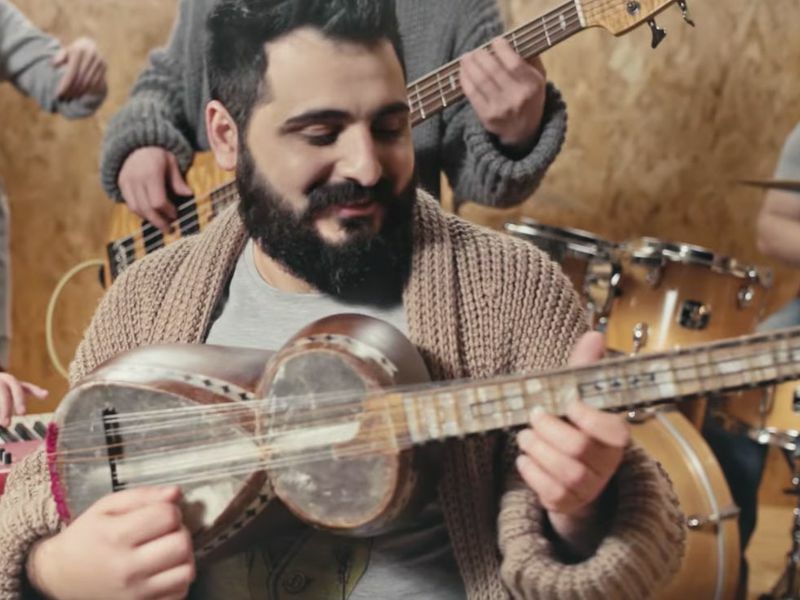 Another musician at the festival, the Grammy-award winning Arto Tunçboyacıyan, who is based in Yerevan, the capital of Armenia, also grew up around music and began performing at a young age. His brother would perform at nightclubs and brought him along. “There was one point I have to make a decision: I’m going to be a football player—soccer—or music. I couldn’t see myself at 40 years old, or 45 years old, hanging out, side of the field, and screaming [at] the people how to play,” he jokes. But “the music I can do just even before the last breath.” To him, Armenian music blends aspects from the East and West. “We always leave one little door open” to those various cultures, he says. Some 50 years after that first performance, Tunçboyacıyan describes his sound as avant-garde folk. He will perform at the festival with members of the Armenian Navy Band, which he founded in 1998. Voskanyan says he hopes Folklife Festival visitors will learn “about a new instrument, about tar,” as well as about his style of folk music. “It’s a very important to show others very different sides of Armenian culture,” he says. Also performing is Zulal, an a capella Armenian-American group that revisits ancestral folksongs; the Kayt Band playing the traditional drum and wind instruments, called the dhol, zurnaand blul; and the Qanon Ensemble under the tutelage of composer and teacher Tsovinar Hovhannisyan. In addition to the music, the festival will feature Armenian cooks, winemakers and artisans. The cooks will offer demonstrations and bake lavash flatbread. Attendees will be able to learn about the 2011 discovery in a cave on the edge of the Areni village of what researchers believe is the world’s oldest winemaking facility, from approximately 4100 B.C.E. The festival will feature a “dig tent” for kids and a virtual reality experience for people to “explore” the real archaeological site. Craftspeople who work with clay, fabric, metal, stone and wood, will be there, as will be shadow-theater troupe and dance workshops. A separate festival program is devoted to traditions from Catalonia. The Smithsonian Folklife Festival is open on Washington, D.C.’s National Mall from June 27 to July 1, and July 4 to 8.